THE GOVERNMENT HAS opened a three-month public consultation today to ask whether you would be okay with your PPS number being used to reform the electoral register. Several proposals have been put forward to clean up the electoral register, which Minister of State for Local Government and Electoral Reform John Paul Phelan said has been an issue of concern for years. Due to people moving house, and duplication on the register, as well as the rigmarole of adding people to the supplementary register at the time of a referendum or election, the minister said reforms are needed to ensure Ireland has a modern electoral register. The minister is proposing a “rolling, continuous” registration system which would allow people to register either online or with the current paper form. Currently, there are 26 different forms associated with the electoral register. Phelan said the “one form, one process, one register” would be open all year round. It would close 14 days before the people go to the polls and reopen the day after an election or referendum – essentially creating a “live” register. The proposal is that a single, secure database would enable cross-local authority checks. In order to remove any duplication, and allow people easy access to registering online, the government needs one single identifier for each citizen. There are a few suggestions put forward as to what this might be, such as a person allowing their PPS number be used as their identifier. Another option put forward is the Public Service Card (PSC) to allow people register. Speaking to the media before the launch today, the minister stated that it is his preferred option that the PPS number be used, adding that only 2.7 million people have a PSC card and if reforms of the register are to be carried out, it would need to be all-encompassing. The minister said all reports delivered to the department find the PPS number should be used, but added “we want to ask what the general public think about that”. He said other countries who have similar systems use either the equivalent to the PPS number or a national identity card. “So, the PPS number is probably the most complete publicly held database of people’s details,” he said. Phelan wanted to make it clear that there is “absolutely no question of anyone’s PPS number being on an electoral register”. He added that no one will have access to the PPS national database – this will reside with the Department of Social Protection. Those working in the local authorities will only have access to an “interface” which would allow identification of duplicates. Legislation will be needed to allow for an “arrangement” between the Department of Social Protection and the local authorities, to give those compiling the register access “on a secure basis”. He said this would only apply to a limited number of people from the local authority. At present, each local authority prepares its own electoral register. The proposal would involve compiling registrations from the 31 local authorities’ registers into a secure, central database. If a person wanted to change their details on the register, such as their address, it would allow them to update their details using their PPS number online to ensure their details like name, address and date of birth match the database. In order for this system to be rolled out, legislation will most likely have to be introduced to allow the Department of Social Protection share information with the local authorities. The new laws will also ensure local authorities are allowed to share information. Currently, the annual door-to-door canvass to check the register is labour intensive for local authorities, with the department believing it may no longer be the most effective way to gather information. It also does not believe household registration is fit for purpose, where one person can register a number of people living in one house. Phelan said the changes, if implemented, would be one of the most significant reforms of the electoral registration process since the foundation of the State, and one of the most significant overhauls of they system since the 1918 change which allowed women to vote. “It would mean the days of the supplementary register are numbered,” said Phelan. He said the new system would end duplication and also avoid polling cards being sent to the families of the deceased, which the minister said can be very upsetting. 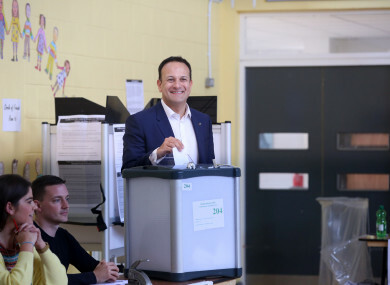 He said duplication is particularly prevalent in Dublin, where many people move around, and where sometimes multiple polling cards can arrive to houses for former residents. The changes could take two to three years to roll out, and there is no estimation of the initial costings. The government believes reforms would deliver savings. The government said it is already in consultation with the Data Protection Commissioner as well as the National Centre for Cyber Security to ensure that security and data protection is paramount. Separately, a number of other reforms have been proposed, such as allowing provisional registration for young people aged 16-17. It is envisaged this option would be open through the schools programme, with registration automatically becoming active on their 18th birthday. “I would have loved the chance in 5th year to pre-register,” said the minister, who added that he was a particularly “nerdy” politically-aware teenager. There are also plans to roll out anonymous registration for people whose safety might be at risk from stalkers or partners they have secured barring orders against. Due to the electoral register being a public document, concerns have been raised about the identity and location being displayed of those at risk. “It is for a changing world, and this is to protect people,” said the minister. Under the new system, only a designated numbers assigned to them would be displayed on the register next to their address. A similar system is in place in the UK, explained the minister, who said the government would be consulting with all relevant domestic violence groups and other stakeholders about the proposed plans. In addition, the reforms also include an overhaul of the system to give specific provision for people with no fixed address, such as those in homelessness, the power to vote. Currently, there is no standard process for this, with the minister stating in his own constituency of Kilkenny it is done through the local hostel. But this is not the case in all counties, with the minister wanting the system streamlined. Phelan also wants to remove the provision for the edited electoral register being allowed to be sold to marketing companies. He said this was introduced when it was a “different world at the time” and allowed local authorities to make some money for the compiling the register. The minister said that while very few have used the provision, “it looks wrong as well as being wrong”. “So we want to return the register for just voting,” he said. Phelan said he wanted to hear from all members of the public as to whether they think the changes will be beneficial and what risks or concerns they might have about the proposed changes, as well as hearing what experiences people might have had recently with the register. To make a submission, you can email registerreform@housing.gov.ie or write to: Electoral Registration Project Consultation, Department of Housing, Planning and Local Government, Custom House, Dublin 1. All written submissions will be published on the department’s website. Email “The government wants to know if you're okay with it using your PPS number to clean up the electoral register”. Feedback on “The government wants to know if you're okay with it using your PPS number to clean up the electoral register”.